The 39-year-old actress recently added a photo with the BTS member to her Instagram stories and she received backlash from few netizens. South Korean actress Ha Ji Won, who is popularly known for her role as young surgeon Song Eun Jae in the MBC medical drama Hospital Ship, has opened up about her friendship with BTS member V aka Kim Tae Hyung. The 39-year-old Secret Garden star, whose real name is Jeon Hae Rim, explained how she became close to the young heartthrob and the Hwarang actor V. According to her, they love seeing artworks and taking photos. "Our hobbies are similar, so we became close quickly. We both enjoy looking at art and taking photos. So if we take pretty photos, we'll share them with each other. We also talk about paintings. I think that's how we became close," Soompi quoted the actress. Last week, Ha Ji Won added a photo of herself with the BTS member to her Instagram stories. The image garnered over 238,000 likes and it received more than 12,000 comments. 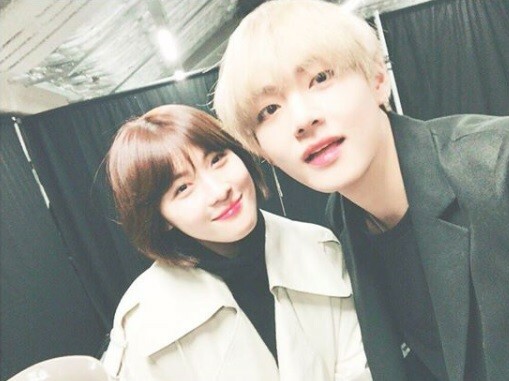 Some of her followers, like Bellaabeliap, praised the two of them and wrote, "You're so beautiful unnie and taetae look so handsome love you both." 매순간 뮤비같은 perfect 한무대. 역시 BTS. 세계최고!✨???✌? The actress also received backlash from few netizens, who criticised her for spending time with V. "Remember your age please. Don't take Tae Hyung from army," a follower of the K-Pop group wrote. "I hate to see her close to tae. I wish nothing happened with you and tae. You are like my mother age so can I call my mother nuna too. Aren't you married yet? Between I'm happy to see you support BTS but I don't like to see you spend time with tae, sorry this is my thought," another BTS fan commented. Shortly, the followers of Ha Ji Won started commenting in her defence. "They are just friends ... I can't believe Jiwon unnie gets so many bash with just a pic with V ~ both of them can take pics with whoever they like, they need to live their own lives too. If you don't like it then just press the bottom on the upper left and leave. Why bother commenting rude words towards Jiwon? Who are you to judge when you know nothing about her? To add on, she's the icon actress in SK so becoming friend with her will also help V in his acting career," a fan of the actress wrote.